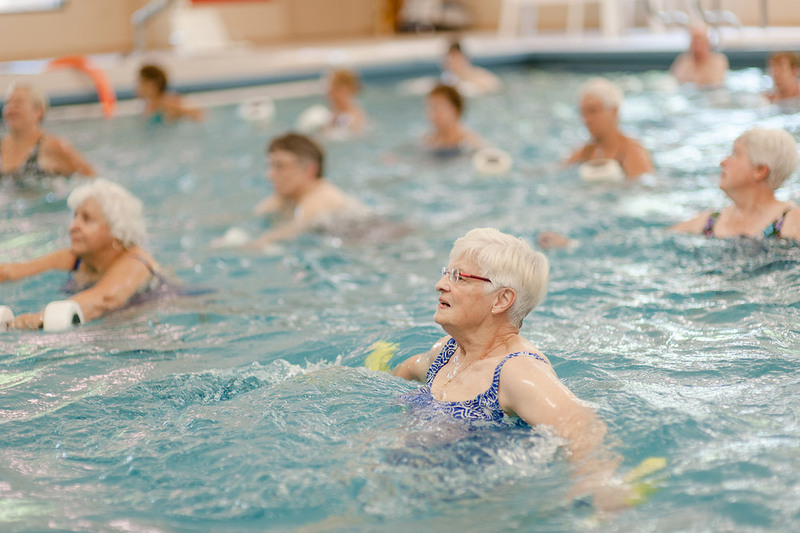 Evergreen Commons has an array of water classes offering multiple benefits to any fitness level. For a complete listing of our pool classes, please check our Group Fitness Class Schedule. Our pool and hot tub are sanitized with a special salt system which is gentler to the skin. The various classes and programs offer toning and cardiovascular fitness for all levels. The hot tub massaging jets increase circulation, provide a therapeutic benefit, and are a great way to end a workout. We offer a wide assortment of classes daily as well as open lap/swim multiple times per day. Our 30' x 60' pool with a depth of 4 to 5 feet is kept at a comfortable 87 degrees and features stairways and a chair lift for those needing extra assistance.